What On Earth has now switched from HTML to PDF. 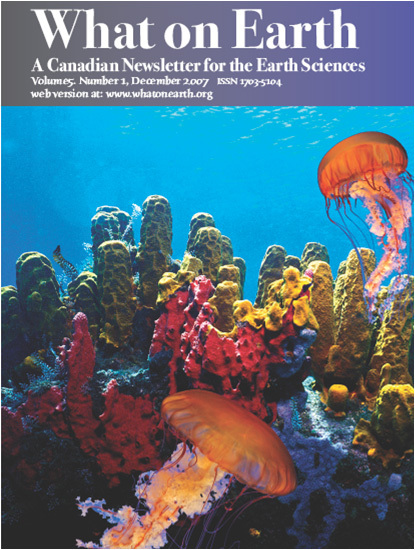 Please click on the cover above to access the PDF for the Winter 2007 issue. Enjoy! Cover: Ediacaran time 600 million years ago. Last updated: July 30th, 2008. Do you find What on Earth interesting and helpful? Would you like to see it continue? Would you like to get copies as soon as they come out? Alternatively, you can contact our Editorial and Subscription Assistant, Patti Foerster: What on Earth, Department of Earth Sciences, University of Waterloo, 200 University Ave. W., Waterloo, ON N2L 3G1. If you have feedback on content, please contact Peter Russell. If you have any feedback on the format, recommendations, or things you'd like to see included, please contact our HTML designer - Alexis Morgan.